Resolve pain and stress at the root. Is that a new idea for you? Do you resolve pain and stress at the root, or do you simply tolerate them? It isn’t practical to expect to never have discomfort as long as you are human. However, you have the power to change your experience by changing your response to your circumstances. Then, your health and quality of life can improve. For one thing, many of today’s respected teachers in the self improvement field are saying so as well. But there, of course, is nothing that compares to personal experience putting it to the test. Years ago I had my own challenges with physical symptoms that didn’t fit traditional diagnoses, and that weren’t responding to conventional approaches. Chiropractic adjustments, physical and occupational therapy, and even massage, offered little, if any temporary relief. And, they sure didn’t change my condition. My doctors were stumped, and didn’t even have a diagnosis. By persisting, I finally found my answers. Once I got to the roots of my situation, it resolved. Then, my health improved, and, so did my quality of life. At one point, I had a consultation with a massage therapist. She asked me if I had examined the emotional aspects of my life/situation. I told her, “I am happy. There is no issue there”. In a seemingly small, but very important way, I was not satisfied. I was beginning to feel more uncomfortable with the dynamics of my job. (I was challenging myself to grow in many ways through being there, which I valued, and do not regret). Though I focused on the job in a way that resonated with me – helping people – I didn’t realize that none of this was really enough. The part of me that I think of as my Soul was guiding me toward that change. It whispered the desire for something more meaningful in my life. The whispers seemed frivolous, and not something I should take seriously. Or, at the very least, they were a “someday, maybe”, but not likely. I believed “that just isn’t me” for whichever reasons. That couldn’t have been further from the TRUTH….. The Grand PLAN for me was otherwise. 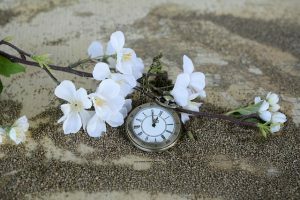 Those whispers grew into shouts that got my attention in the way I would hear and understand: physical discomforts that became concerning, and more limiting. When I listened, and learned to resolve pain and stress at the root, my health improved, my symptoms subsided, and my life improved beyond anything I dreamed. My relationship to myself, my life, and my health became clearer, and richer. And, this all happened very naturally, organically, synchronistically. It was magical in a way. Becoming more respons-ABLE helped me maintain improved balance in my life, giving me more energy, better health, increased connection and confidence in my decisions, and JOY. It gives me a sense of peace and “knowing” that underlies all, and gets me thru the tough times. 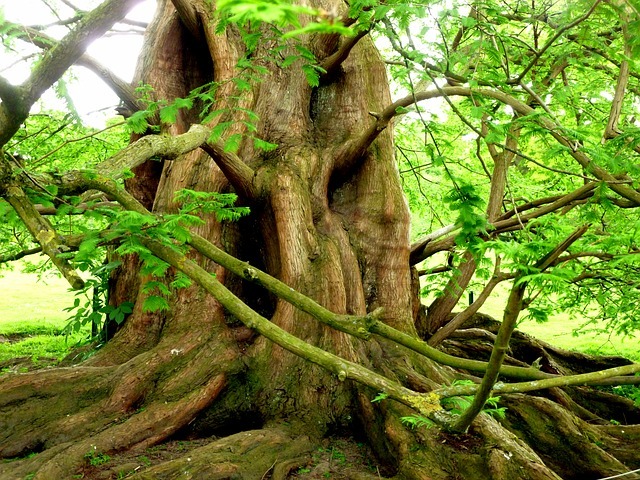 How can you resolve pain and stress at the root? Using the same approach I have been sharing with you in my previous posts. It is exactly what I did, but I went about it in a less streamlined-fashion because I had to find my own way thru it with a lot of self-study and reading. I have found the shortcuts, and am sharing them with you. I have covered much in my previous posts (and even more if you are on my mailing list….. are you on my mailing list? If not – here’s your chance to join…..). 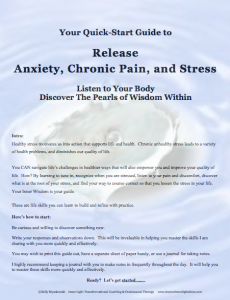 To help you pull it all together, and begin to try it out for yourself, get your copy of my one-page, quick-start guide to “Release Anxiety, Chronic Pain, Tension, and Stress. Listen to Your Body and Harvest the Pearls of Wisdom Within”. It will help you create the energy, clarity, confidence, joy, and peace you desire by tuning in to your Inner Wisdom, connecting the dots between what is going on in your body, and in your life. It will help you resolve pain and stress at the root.